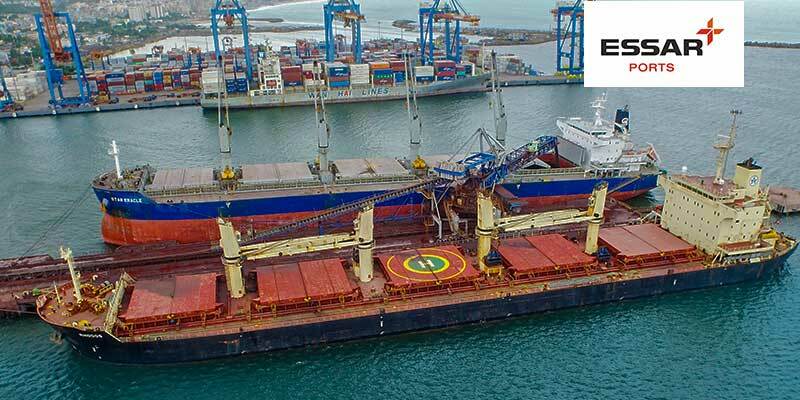 The 24 MTPA Vizag Iron Ore Handling Complex, which is India’s largest iron ore handling facility operated by Essar Vizag Terminal (EVTL) on the outer harbour of Vizag Port, has commenced cargo movement for two public sector giants–NMDC (National Mineral Development Corporation) and MMTC (Metals & Mineral Trading Corporation of India). The PSU firms envisage movement of 3 MTPA of high-grade fines / CLO (Callibrated Lump Ore) until FY21. This is likely be to enhanced by another 2 MTPA of low-grade fines, taking the total cargo handled to 5 MTPA by FY21. NMDC’s first shipment of 66,665 tonnes was completed in 19.25 hours (20.50 hours gross), thus achieving a throughput of 82,776 TPD (tonnes per day) and helping NMDC / MMTC earn a “dispatch bonus”. Additionally, EVTL has successfully helped meet other key customer requirements, such as reducing foreign contamination and achieving zero dead freight. NMDC / MMTC have been exporting to Japanese and South Korean companies as part of India’s bilateral trade agreements in force since 1976. On 12 July 2018, Shri. Nitin Gadkari, Hon’ble Minister for Road Transport & Highways, Shipping and Water Resources, inaugurated the Vizag iron ore handling complex that has been built at a cost of Rs 830 crore. With its state-of-the-art cargo handling equipment, EVTL has the fastest vessel turnaround time for iron ore among Indian ports. The terminal recently received a completion certificate, having successfully demonstrated the Integrated Rated Capacity of 8,000 TPH (tonnes per hour) at the outer harbour facility. The iron ore handling complex can also berth Super Capesize vessels up to 200,000 DWT, with a depth of 20 metres. “Now that we are moving NMDC / MMTC cargo, we are proud to be strengthening India’s bilateral trade ties with Japan and South Korea. Our plans to increase our share of third-party cargo has also receive a significant boost,” said Mr Rajiv Agrawal, CEO & MD, Essar Ports.